Setting up a CardPointe account is simple and straightforward. You can get started by clicking here to schedule a call with a CardPointe specialist who well help you customize your account. HOW MUCH DOES CARDPOINTE COST? Access to the CardPointe processing platform, is just $15 per month. Refer to the pricing page for details on specific merchant account programs and monthly specials. WHY SHOULD I USE CARDPOINTE? CardPointe provides the most secure processing network on the market for a single low-monthly fee. The CardPointe suite of services saves you time and money by streamlining your payment processing solution for your business. We invite you to decide for yourself. Check out the pricing page for the latest CardPointe promotion! IS THERE A LONG TERM CONTRACT TO SET UP CARDPOINTE? No. All agreements are month to month agreements. If, for any reason, you decide that the service is not for you just cancel at any time without penalty. 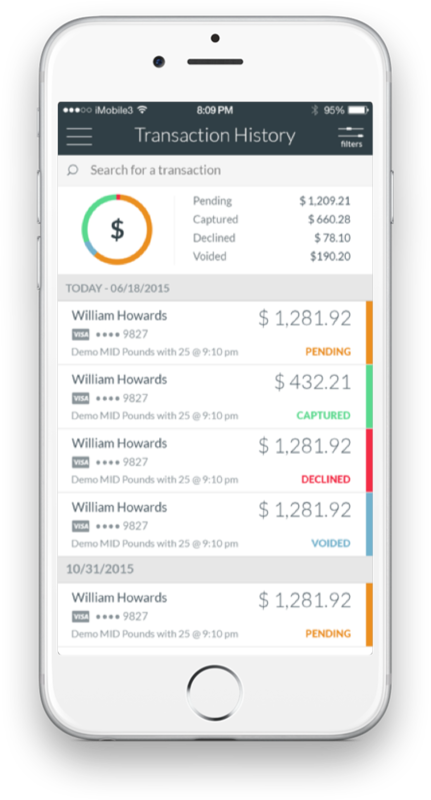 CardPointe allows you to process transactions on a retail terminal, the mobile app (smart phone and iPad compatible) and the online virtual terminal and view transactions in real time across any CardPointe reporting tool. IS IT REALLY THAT SIMPLE TO USE? CardPointe users frequently tell us that the system is easy to use, extremely straightforward and “clean.” The simple and customizable interface allows you to process payments easily and recall transactions and processing data at the click of a mouse. See our tutorials page for detailed video training on the virtual terminal, mobile phone app and the CardPointe retail terminal. HOW SECURE IS MY CUSTOMER'S PAYMENT INFO? CardPointe runs on a patented Point to Point encryption called CardSecure. Your customers data will never be compromised!